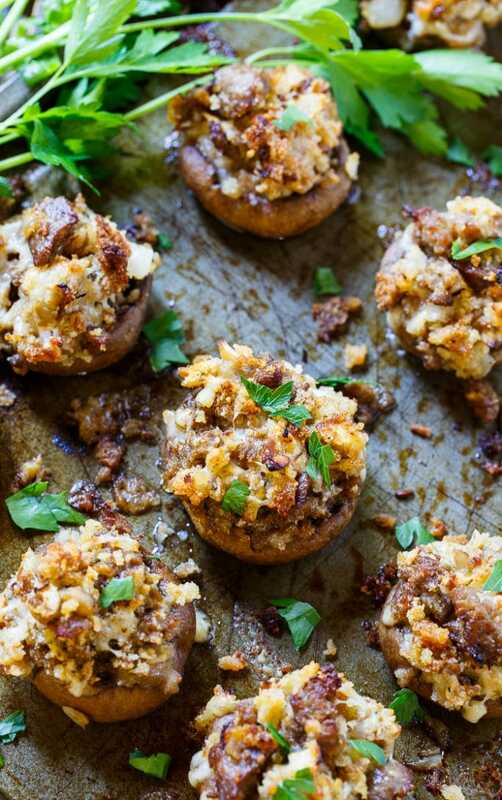 Stuffed Mushrooms make such a fantastic party appetizer. 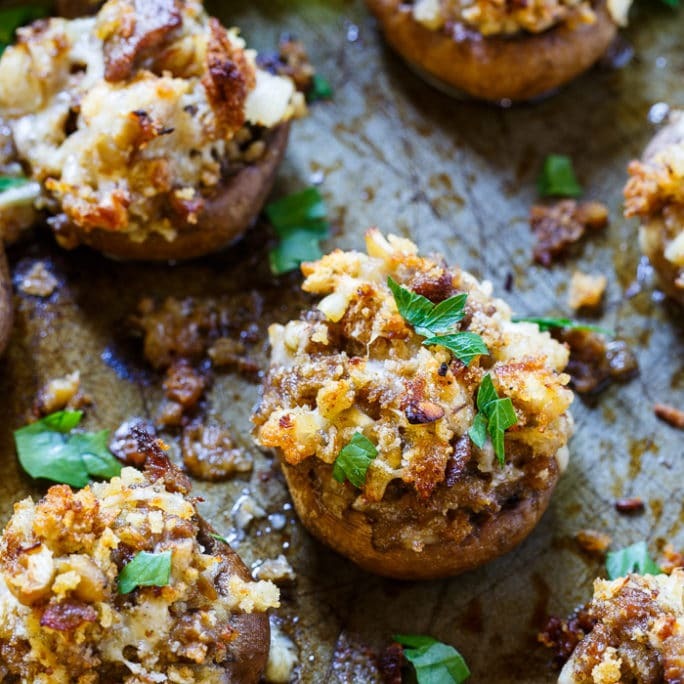 These Sausage Stuffed Mushrooms are a mixture of sausage, onion, garlic, stuffing mix, and Monterey Jack cheese. A little mayonnaise holds the filling together and makes it creamy. The filling can be prepared ahead of time (even the day before). And the mushrooms can be stuffed ahead of time and refrigerated. Just add a few minutes to the baking time to compensate. 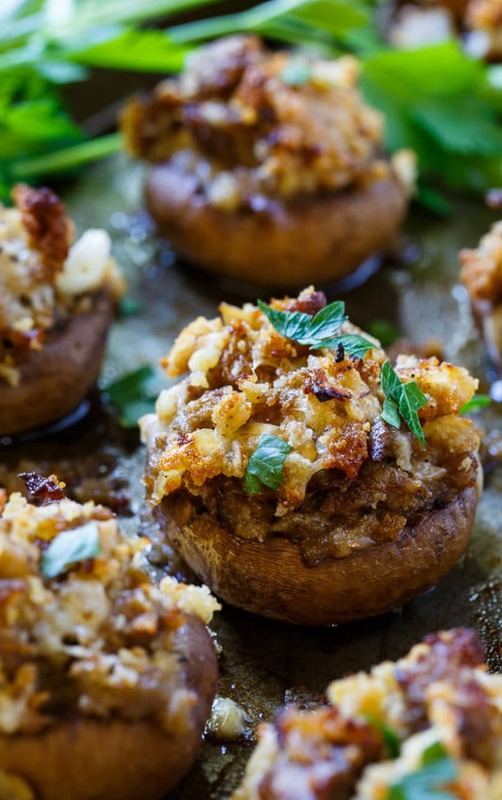 I love, love, love mushrooms and I think my favorite way to eat them is stuffed. They can be stuffed with pretty much anything and the options are endless. Use either hot, mild, or sweet Italian sausage depending on the amount of heat and the flavor you want. 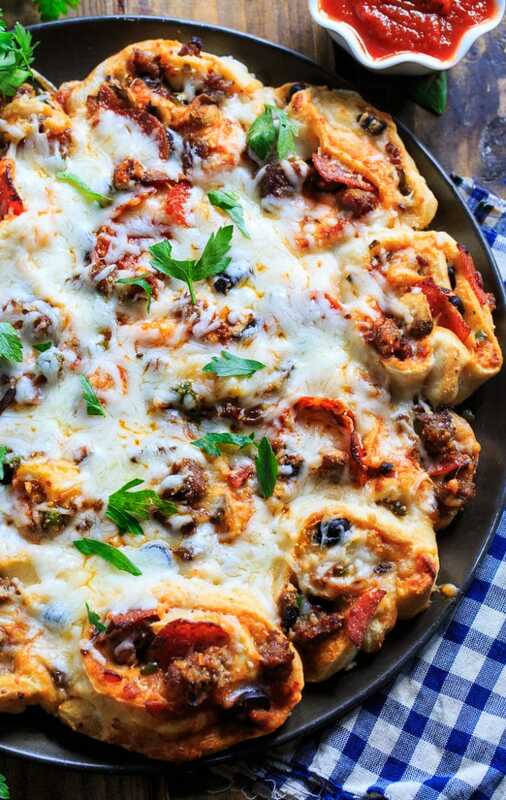 You could even use chorizo. That would be delicious. 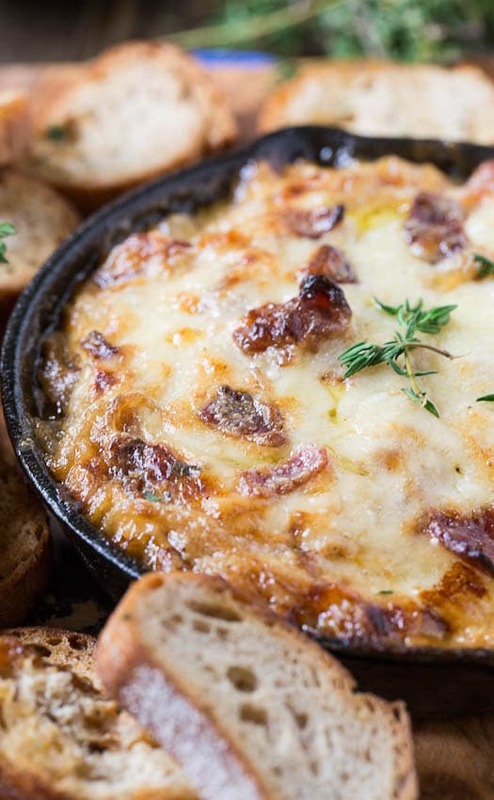 The Monterey Jack cheese could also be switched out for cheddar cheese or Parmesan or even mozzarella. 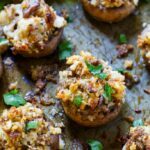 Mushrooms stuffed with a mixture of Italian sausage, onion, garlic, stuffing mix, and cheese make a great party appetizer. Place mushroom caps hollow side up on prepared baking sheet. Add olive oil to a nonstick pan and place over medium heat. Add sausage, mushroom stems, and onion. Cook, using a wooden spoon to break sausage into small pieces, until sausage is cooked through. Remove pan from heat and let mixture cool. Stir in mayonnaise, stuffing mix, pepper, and cheese. 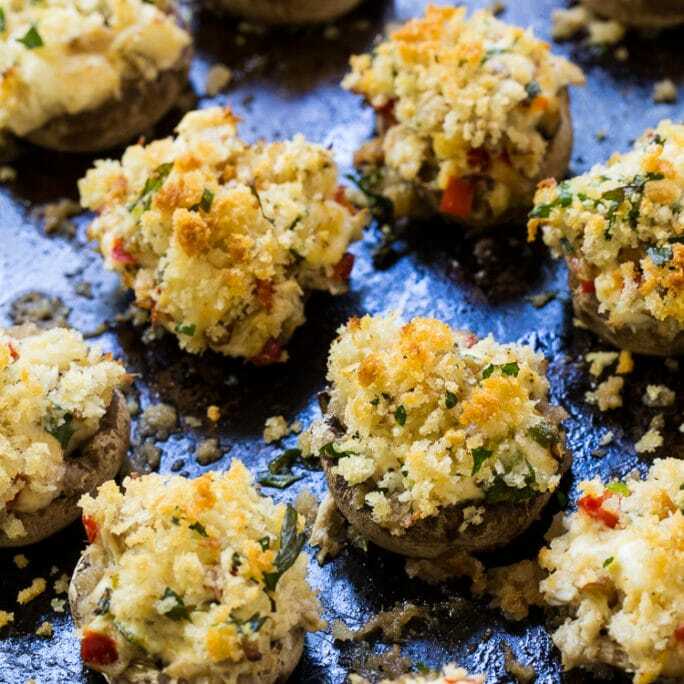 Place a heaping spoonful of filling into each mushroom cap. Tip: Unless the mushrooms are really dirty, don't rinse them. Just wipe them with a damp paper towel. This entry was posted in Appetizers and tagged mushrooms, Pork, Sausage. Bookmark the permalink. Absolutely delicious! Next time, I might crush the seasoned stuffing (mine had large bread cubes) just so it fit into the mushroom caps a little easier. Fabulous recipe. Thank you. Do you cook stuffing or use the dry mix? 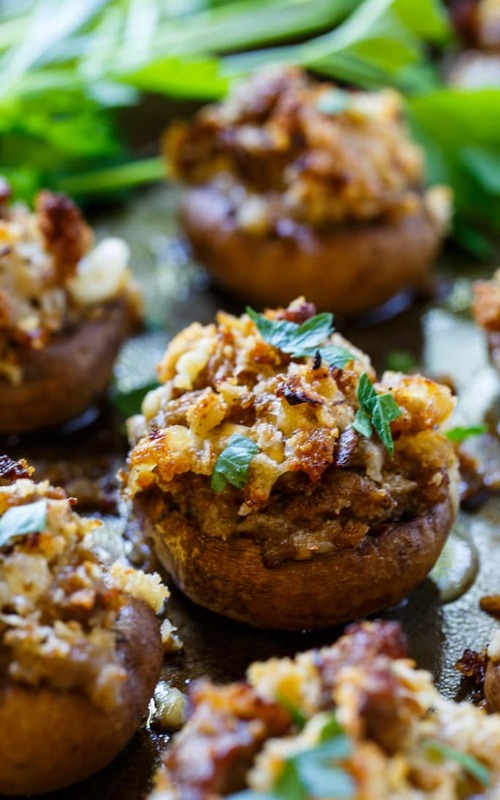 Stuffed mushrooms are the way to my heart! If these were at a party I would never let them out of my sight! 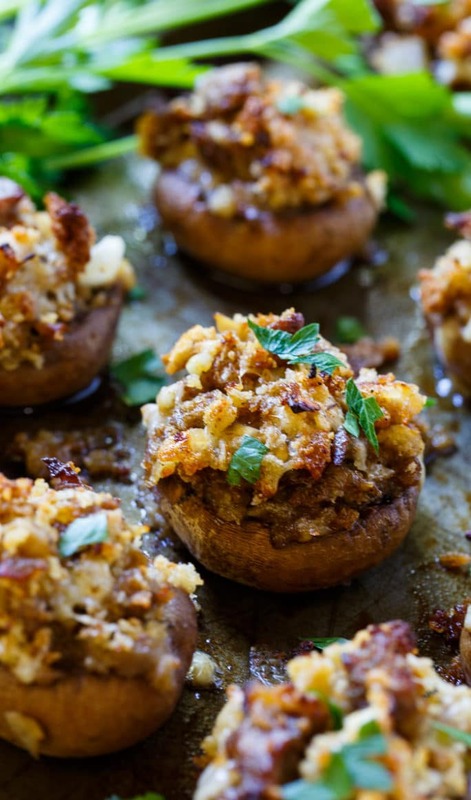 Mushrooms of any kind are my favorite, so I have no doubt that I would devour these ALL! Love your gorgeous pictures, Christin!